Photobucket Blues.... Where Have All the Screencaps Gone? Dear Frodo Screencap fans, I apologise for the hiatus in screencap service on most of the FotR entries! Estë pointed out to me that she could not see some caps when viewing the "Frodo Screencap" entries. I checked this morning and the great bulk of them were down! Nearly the whole FotR album! I have no idea how this happened, since I haven't taken the links down and they are still up in the albums. The only thing I can think of is that over the weeken I complained to Photobucket that someone - not me - had taken down my cap from Brokeback Mountain, the one showing the two characters in a close-up kiss scene. Only their faces, in a very dark, hard-to-see picture! Was it censorship? I had moved it under a cut, too! I checked: the link wasn't down, but the image had been removed from my album. I couldn't believe it. This morning I see that the image has been restored. But now a hundred Frodo screencap links are disconnected! I have been tinkering around. 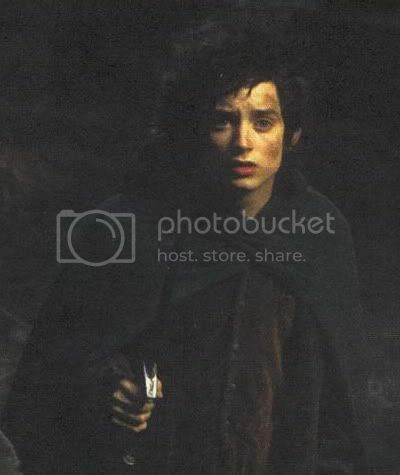 Since the images are still in the Photobucket album, it looks as though I can restore the Frodo caps them by re-entering all the links in the LJ entries. I should be done in a few hours. If that doesn't work, I will have to complain again to Photobucket. Doesn't it just figure? Last week, after a year, I upgraded my Photobucket from 'free' to a paid account. ETA: "One learns by making mistakes......"
SO. Although I didn't change the names of any of the caps, changing the name from "FotR caps" to "FotR caps I" effectively broke all the links. Every cap I had posted before I changed the album name wound up with a slightly different code from what it had had before. So, for you folks out there who are as negligent as I at reading the directions for a site, let that be a lesson to you. If you alter the name of an album in your image-hosting account, you end up breaking all the links. Heaven knows in which threads and LJ's I have posted these screencaps! All those links are broken, too. All better! It didn't take as long as I thought. I've added my solution above. Oh my goodness! I hope you can get everything restored. What a shock to discover such a thing. It's fixed, and in less time than I had thought it would take. I'll confess my error in an ETA, just so other similarly dim album users can be aware. Thanks for the ETA! I'm a Photobucket newbie, and need all the tips I can get. Thanks for saying that, Shirebound. I was a little embarrassed to admit I did such a silly thing, but I thought telling what I did wrong might help someone else avoid doing the same thing. Well, at least there's a tiny little comfort in you having learned the lesson on our behalf as well. It is a warning well heeded. I'm sorry you're having this hassle. Is it from Weathertop? It looks like it. I suppose I'll find out when I get that far in my screencaps. If you have not been lurking, Maeglian, I made a "table of contents of links," for the screencaps (Frodo, EW out of character as Frodo, and EW in other roles in which I think of him as "young Frodo"), in the "Links" list on the main journal entry page (left-hand margin). I found it tedious to wade through all the "Frodo screencaps" trying to find a particular set, even using the "tags" feature. What an incredible HEADACHE!! Congratulations on figuring it out so quickly.. I would be still crying under the bed. Utterly gorgeous and heartrending picture of Frodo by the way. He looks like a dream image. He makes my heart bleed with that expression. "He looks just like a dream image." He does, doesn't he? I loved that image as soon as I saw it on some gallery of Frodo pics or other. The atmosphere looks misty, atomized, maybe that's why. When I get to Weathertop, I'll bet I'll see it there. There was a lot of mist produced for that scene. And he certainly looks like he might have just seen the Witch King rising up over the rim of the stones.